People should have affordable access to the full range of safe and effective options for abortion care, including self-management with medication. In addition to existing barriers that limit access to abortion care overall, there are unique obstacles that must be overcome before self-managed medication abortion can be available to all in a meaningful way. It is essential that individuals seeking to self-manage an abortion have a source of accurate information and access to medical care if necessary. Self-managed abortion is not a new phenomenon, but many long-standing biases and assumptions about it are worth challenging and updating. Phrases such as “coat-hanger,” “back-alley” or “clandestine” abortion harken back to the era before Roe v. Wade established a constitutional right to abortion and haunt contemporary discussions by referencing a range of unsafe abortion practices. In particular, these phrases reflect fear about returning to an age in which abortion care was often unsafe in the United States. This fear is reinforced by the way abortion care has evolved in the decades since Roe v. Wade. Legal and safe abortion in the United States is typically associated with a medical service provided in a clinic or hospital. Therefore, the notion of self-managing an abortion outside a formal medical setting arouses concern for many people, especially those who learned about abortion during the pre-Roe era. This apprehension has taken on new significance as advocates and policymakers grapple with the implications of a changing U.S. Supreme Court. Newly appointed Justice Brett Kavanaugh is expected to tilt the balance of the court against abortion access, calling into question the future of Roe v. Wade and the protections it affords. In this context, self-managed abortion is sometimes positioned as a work-around or “last resort” for a future scenario in which abortion access is severely limited. This framing is flawed for several reasons. First, it overlooks the reality that abortion access is already limited for many women, as well as for transgender men and gender-nonconforming people, because of restrictive policies in many states and the lack of abortion clinics in wide swaths of the country. Second, it ignores the existence of safe and effective models for self-managed abortion care. And, third, it fails to account for the possibility that some people, such as those who have reason to distrust the medical system, may opt to self-manage abortion for reasons other than lack of access to a clinic, such as increased privacy and autonomy. Instead, many forward-looking thinkers—including providers, researchers and advocates—are working toward a future in which everyone seeking abortion care has access to the full range of safe and effective options, including self-managed methods.1–3 In this scenario, all who opt to pursue self-management would have access to the information they need and to a provider of their choice if they need or want one at any stage. They would not be outside of the health care system, but rather supported by it in a new way. This vision is not as far-fetched as it might sound. Medication abortion, in particular, holds great promise for the future of self-managed abortion care in the United States, and understanding the steps and barriers to achieving a fully independent model of self-managed medication abortion is critical to normalizing and advancing this vision. The FDA-approved regimen for medication abortion is sanctioned for use up to 70 days since the patient’s last menstrual period and consists of two medications currently available by prescription: mifepristone, which works by blocking progesterone (a hormone needed for a pregnancy to continue); and misoprostol, taken 24–48 hours later, which induces contractions and ends the pregnancy.7 Special FDA rules require anyone seeking mifepristone to access it, along with FDA-mandated information, from specific providers; misoprostol is not subject to the same rules and may be dispensed on-site at the same time or accessed thereafter via a prescription. Once received, the medications may be taken in any setting—allowing individuals to complete their abortions wherever they choose. More providers. Under the current REMS requirements, providers must complete a certification form attesting to certain basic competencies and return it to the drug’s manufacturer. This requirement may dissuade some providers from offering medication abortion if they fear their information could become public and result in harassment.12 In addition, having to stock mifepristone in advance can represent a significant financial or logistical barrier. It can also prevent a wider range of clinicians, such as obstetrician-gynecologists and family medicine practitioners, from offering medication abortion if they work in a practice with others who oppose or do not want to be associated with abortion care. Removing these requirements could expand the pool of abortion providers and other clinicians willing and able to offer medication abortion. More locations. With pharmacies available in an increasing variety of settings, the ability to pick up medication abortion pills at a pharmacy or receive them in the mail like most other prescription drugs has the potential to be much more convenient for many people. Filling a prescription at a pharmacy or online could also enhance privacy by allowing people to pursue abortion care without visiting a clinic. At the same time, having medication abortion available alongside other prescription drugs could help reduce stigma and further normalize this method of abortion. Stigma. While lifting the REMS may decrease logistical barriers to offering medication abortion, the prevailing stigma surrounding abortion could continue to discourage many providers from doing so. Also, animus from the vocal minority opposed to abortion could prevent some pharmacies from stocking and offering mifepristone. Refusals. A patchwork of federal laws explicitly allows many health care professionals and institutions to refuse to provide care related to abortion, and almost every state has adopted similar policies.17 In the context of pharmacy services, there is already a product—emergency contraception—that is sometimes denied by individual pharmacists refusing to fill prescriptions or by pharmacies that refuse to sell the medication at all. Similar scenarios will undoubtedly play out if the REMS on mifepristone is lifted and the drug’s manufacturer is allowed to sell it to pharmacies. State restrictions. States have targeted and restricted access to medication abortion ever since the FDA first approved it. Thirty-four states limit its provision to physicians, despite recommendations from the World Health Organization (WHO) and the National Abortion Federation that midlevel providers, such as physician assistants and advanced practice nurses, can safely provide medication abortion.18–20 In addition, 19 states require the clinician providing medication abortion to be physically present with the patient, effectively banning the use of telemedicine to prescribe the medication remotely.18 Increasingly, antiabortion policymakers are also targeting clinics with medically unnecessary restrictions designed to prevent them from offering medication abortion altogether. While lifting the REMS on mifepristone would open new possibilities for medication abortion access, stopping there would fall short of realizing the full potential of this method, particularly when it comes to self-managed abortion care. In a self-management model, anyone who needs to terminate a pregnancy would be able to legally access mifepristone and misoprostol without a requirement to see a health care provider or pharmacist first. Yet this is not the same thing as “going it alone”: In a fully supported model of care, individuals would have access to the information and support they need, including consultation with a provider and medical care if necessary or preferred at any stage. In a 2015 guideline, WHO identified three individual components of self-managing a medication abortion during the first trimester: self-assessing eligibility; managing the mifepristone and misoprostol medication without direct supervision of a health care provider; and self-assessing completeness of the abortion process using pregnancy tests and checklists.21 Evidence indicates that at least two of these components—managing the two-drug regimen without direct provider supervision and self-assessing completeness—can be done safely, and WHO supports them in specific circumstances. Just one task, patients’ ability to self-assess eligibility, still needed more evidence as of the 2015 guidance.21 However, an increasing body of evidence indicates that women can determine gestational age based on their last menstrual period, and technology such as mobile phone applications or online calculators can aid this assessment.22 Evidence also suggests that other eligibility criteria, such as contraindications for the medication, can be assessed using simple checklists. To fully integrate self-managed medication abortion with existing abortion practices in the United States, misoprostol and mifepristone must first become available without a prescription. The usual pathway to over-the-counter (OTC) status for a prescription-only drug is for the manufacturer to apply to the FDA to change the drug’s status, a process that requires the manufacturer’s interest in making its products available OTC and also its willingness to invest significant resources into the application process. In particular, specific studies demonstrating consumers’ ability to accurately comprehend a product’s label, self-identify eligibility and safely use the medication without medical supervision are necessary to support an application for OTC status.22 Success will also require a federal administration that allows the FDA to make such determinations based on scientific evidence rather than politics or ideology; the long road to OTC status for emergency contraception offers a cautionary tale in this regard. Stigma and criminalization. Abortion stigma is heightened when it comes to self-managed abortion, due at least in part to fear and misunderstanding about the process. Since Roe v. Wade, a number of people have been prosecuted for self-managing abortion under a variety of state statutes, ranging from laws against fetal homicide to those that criminalize failure to report an abortion to the coroner. In recent years, the issue has gained greater attention because of several well-publicized cases in which women were prosecuted—and even imprisoned—for self-managing an abortion or being suspected of doing so.23 In some cases, women who self-managed an abortion have been reported to law enforcement after revealing their actions to a health care provider, despite medical privacy laws that should protect them from such consequences. 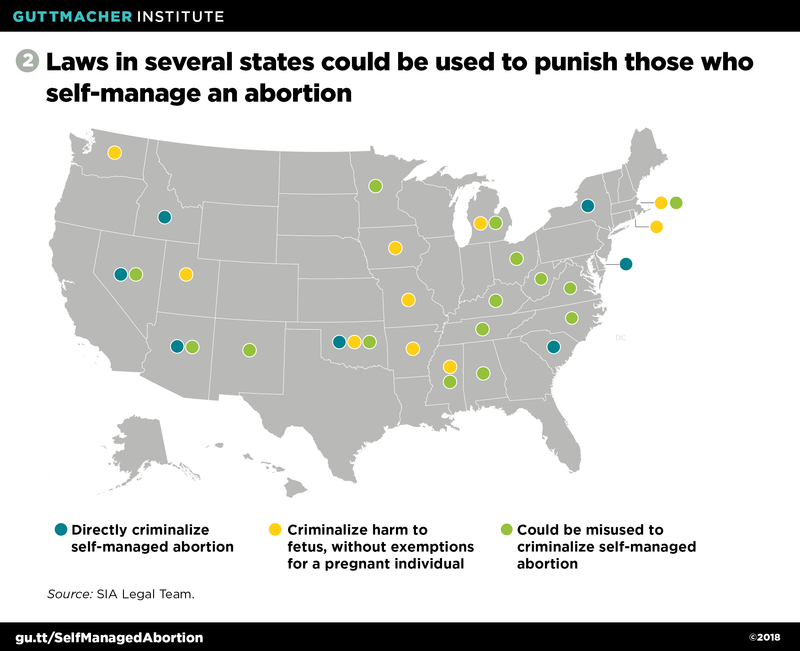 Whether and how laws that have been used to criminalize self-managed abortion would apply if mifepristone and misoprostol were approved as OTC medications requires further analysis. Recent cases demonstrate that no matter the outcome of that analysis, law enforcement officials who seek to take a political stand against abortion would rely on any laws that might be applicable to arrest and potentially prosecute people who self-manage abortion. History also indicates that the risk would be greatest for people who are already disproportionately criminalized, including low-income people and people of color. Other state restrictions. It is unclear if and how individuals conducting a self-managed medication abortion would have to comply with a variety of existing restrictions on abortion, such as waiting periods, mandatory ultrasound laws, parental consent or notification requirements, and abortion reporting laws and procedures. Moreover, antiabortion policymakers will not limit themselves to what is already out there; if medication abortion is approved for OTC status, state and federal lawmakers would almost certainly pursue new ways of restricting access to it. Refusals. As noted earlier, the benefits of expanding medication abortion availability to pharmacies are diminished if some pharmacies refuse to stock the drugs or individual pharmacists refuse to fill prescriptions. Refusals to provide follow-up care could also become an issue. Affordability. Affordability is a major barrier to abortion access in the United States. The average amount paid for an early medication abortion (up to 9 weeks’ gestation) in 2014 was $535.27 Moreover, because of federal and state restrictions, millions of people lack insurance coverage for abortion. Nonetheless, about four in 10 privately insured abortion patients use their insurance to pay for the procedure,28 and Medicaid covers abortion for low-income individuals in 16 states.29 Perversely, OTC status can have the effect of making a medication less affordable if insurance companies decline to cover it without a prescription. Moreover, although conventional wisdom suggests that OTC status encourages the development of generic alternatives that are lower in cost, this theory has not panned out in the case of emergency contraception. Advocates and policymakers must ensure, at the very least, that medication abortion does not become available OTC without adequate safeguards in place for existing insurance coverage. Ideally, this effort would proceed hand-in-hand with strategies to promote other affordable options. Adapting current models. Accommodating self-managed medication abortion will require adaptations to ensure that clinic-based providers can play a role in supporting people who self-manage while continuing to serve those who need or want a clinic-based procedure. For example, they could serve as a source of accurate information about self-management and offer care if it is needed or wanted at any stage. This would require payment and reimbursement systems that compensate providers adequately for providing these services. 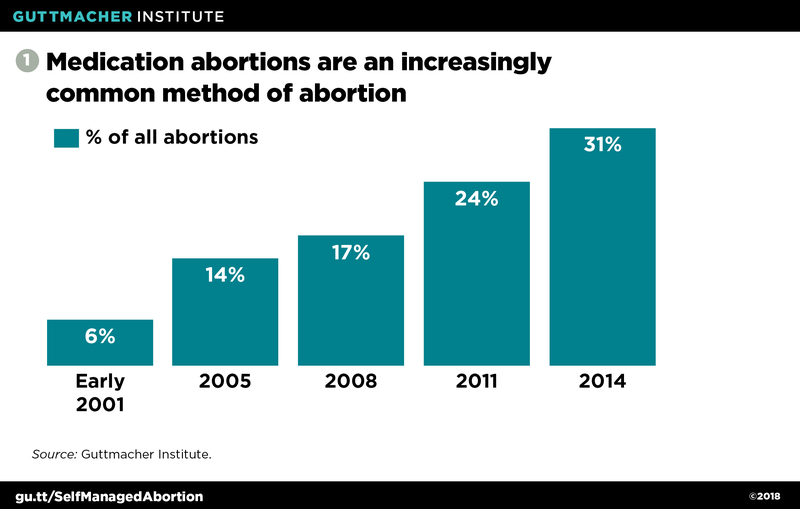 Such considerations would be even more important if increasing interest in self-managed abortion leads to a decline in clinic-based care, because that decline could otherwise lead some clinics to close. Ultimately, facilitating access to self-managed medication abortion is about ensuring that all people have access to the full range of evidence-based, safe and effective options for ending a pregnancy. There will always be a need for other options, including surgical methods. Nonetheless, a growing reliance on self-managed abortion may prompt providers to shift how they think about and offer services to their clients. Meanwhile, available data indicate that some individuals in the United States are already pursuing self-managed abortion using either misoprostol or other substances.6,28 Even as we look ahead to a future model that more fully supports a self-managed approach, we must work to ensure that people who currently seek to self-manage abortion are not punished. Right now, when abortion access is increasingly tied to a person’s resources and zip code, and with the likelihood that the U.S. Supreme Court will be more hostile to abortion than it has been in decades, it may seem counterintuitive to map out a forward-looking vision that positions self-managed abortion as anything more than a work-around to restrictive policy environments and decreasing access to services. But lifting the REMS on mifepristone and securing OTC status for medication abortion are advances that do not depend on state legislatures or the Supreme Court. And just as the current threats can inspire cynicism about the future of abortion access in the United States, so too should they inspire creative thinking and a desire to pursue new models. Ultimately, success depends on viewing self-managed medication abortion as an option that emphasizes reproductive freedom and personal autonomy without limiting or excluding other options. 1. The SIA Legal Team, 2017, https://www.sialegalteam.org/. 2. Advancing New Standards in Reproductive Health, Gynuity Health Projects and Ibis Reproductive Health, A Roadmap for Research on Self-Managed Abortion in the United States, 2018, https://ibisreproductivehealth.org/publications/roadmap-research-self-managed-abortion-united-states. 3. Reproaction, Self-managed abortion, 2018, https://reproaction.org/campaign/self-managed-abortion/. 4. Finer LB and Henshaw SK, Abortion incidence and services in the United States in 2000, Perspectives on Sexual and Reproductive Health, 2003, 35(1):6–15, https://www.guttmacher.org/journals/psrh/2003/01/abortion-incidence-and-services-united-states-2000. 5. Jones RK and Kooistra K, Abortion incidence and access to services in the United States, 2008, Perspectives on Sexual and Reproductive Health, 2011, 43(1):41–50, https://www.guttmacher.org/journals/psrh/2011/03/abortion-incidence-and-access-services-united-states-2008. 6. Jones RK and Jerman J, Abortion incidence and service availability in the United States, 2014, Perspectives on Sexual and Reproductive Health, 2017, 49(1):17–27, https://www.guttmacher.org/journals/psrh/2017/01/abortion-incidence-and-service-availability-united-states-2014. 7. U.S. Food and Drug Administration (FDA), U.S. Department of Health and Human Services (HHS), Mifeprex (mifepristone) information, 2018, https://www.fda.gov/Drugs/DrugSafety/ucm111323.htm. 8. Chen MJ and Creinin MD, Mifepristone with buccal misoprostol for medical abortion: a systematic review, Obstetrics & Gynecology, 2015, 126(1):12–21, https://escholarship.org/uc/item/0v4749ss. 9. The National Academies of Science, Engineering and Medicine, The Safety and Quality of Abortion Care in the United States, Washington, DC: National Academies Press, 2018, http://nationalacademies.org/hmd/reports/2018/the-safety-and-quality-of-abortion-care-in-the-united-states.aspx. 10. Center for Drug Evaluation and Research, FDA, HHS, Clinical review: Mifeprex, 2016, https://www.accessdata.fda.gov/drugsatfda_docs/nda/2016/020687Orig1s020MedR.pdf. 11. American Civil Liberties Union (ACLU), Lawsuit challenges medically unjustified FDA restrictions that push medication abortion out of reach, news release, New York: ACLU, Oct. 3, 2017, https://www.aclu.org/news/aclu-challenges-federal-restrictions-abortion-pill. 12. Mifeprex REMS Study Group, Sixteen years of overregulation: time to unburden Mifeprex, New England Journal of Medicine, 2017, 376:790–794, https://www.nejm.org/doi/pdf/10.1056/NEJMsb1612526. 13. American Medical Association (AMA), Ending the Risk Evaluation and Mitigation Strategy (REMS) policy on mifepristone (Mifeprex), Policy H-100.948, 2018, https://www.ama-assn.org/sites/default/files/media-browser/public/hod/a18-resolutions.pdf. 14. American College of Obstetricians and Gynecologists (ACOG), ACOG statement on medication abortion, news release, Washington, DC: ACOG, Mar. 30, 2016, https://www.acog.org/About-ACOG/News-Room/Statements/2016/ACOG-Statement-on-Medication-Abortion. 15. TelAbortion, The Telemedicine Abortion Study, Welcome, no date, http://telabortion.org/. 16. Chong E et al., The TelAbortion Project: delivering the abortion pill to your doorstep by telemedicine and mail, Obstetrics & Gynecology, 2018, 131(Suppl. 5):53S. 17. Guttmacher Institute, Refusing to provide health services, State Laws and Policies (as of September 2018), 2018, https://www.guttmacher.org/state-policy/explore/refusing-provide-health-services. 18. Guttmacher Institute, Medication abortion, State Laws and Policies (as of September 2018), 2018, https://www.guttmacher.org/state-policy/explore/medication-abortion. 20. National Abortion Federation (NAF), Clinical Policy Guidelines for Abortion Care, Washington, DC: NAF, 2018, https://prochoice.org/resources/clinical-policy-guidelines/. 21. WHO, Health Worker Roles in Providing Safe Abortion Care and Post-Abortion Contraception, Geneva: WHO, 2015, http://www.who.int/reproductivehealth/publications/unsafe_abortion/abortion-task-shifting/en/. 22. Kapp N et al., A research agenda for moving early medical pregnancy termination over the counter, BJOG, 2017, 124(11):1646–1652, https://obgyn.onlinelibrary.wiley.com/doi/full/10.1111/1471-0528.14646. 23. Rowan A, Prosecuting women for self-inducing abortion: counterproductive and lacking compassion, Guttmacher Policy Review, 2015, 18(3):70–76, https://www.guttmacher.org/gpr/2015/09/prosecuting-women-self-inducing-abortion-counterproductive-and-lacking-compassion. 24. SIA Legal Team, Roe’s Unfinished Promise: Decriminalizing Abortion Once and for All, 2018, https://www.sialegalteam.org/rufp. 25. ACOG, Decriminalization of self-induced abortion, position statement, 2017, https://www.acog.org/Clinical-Guidance-and-Publications/Position-Statements/Decriminalization-of-Self-Induced-Abortion. 26. AMA, Oppose the criminalization of self-induced abortion, Policy H-5.980, 2018, https://www.ama-assn.org/sites/default/files/media-browser/public/hod/a18-resolutions.pdf. 27. Guttmacher Institute, Induced abortion in the United States, Fact Sheet, New York: Guttmacher Institute, 2018, https://www.guttmacher.org/fact-sheet/induced-abortion-united-states. 28. Jerman J, Jones RK and Onda T, Characteristics of U.S. Abortion Patients in 2014 and Changes Since 2008, New York: Guttmacher Institute, 2016, https://www.guttmacher.org/report/characteristics-us-abortion-patients-2014. 29. Guttmacher Institute, State funding of abortion under Medicaid, State Laws and Policies (as of September 2018), 2018, https://www.guttmacher.org/state-policy/explore/state-funding-abortion-under-medicaid.